Homemade Claussen Knock-Off Pickles: Always crunchy and garlicky, this perfect homemade pickle requires no special equipment, & no canning experience. It’s common knowledge that I have a salty tooth rather than a sweet tooth. When the weather does what it has been doing lately (making us all do our best Shadrach, Meshach and Abednego impersonations) I can’t think of a single thing I find more refreshing than an icy-cold, salty, crunchy pickle. Oh yes. You can keep your popsicles* and those icy squeezy pop things whose name currently escapes me. I’m on deck with the pickles. *I will, however, fight you for fudgesicles. That’s just the way it is. It’s not just me, it’s my whole family: mother, sisters, brothers, cousins, aunts, grandparents, kids, husband… I married a man who loves pickles so much he eats the pickles and then drinks the juice from the jar. In fact, in an attempt to show my husband just how much she loved him, my mom made a special pickle juice drink for him at our wedding. And he drank it*. Happily. *He drinks pickle juice regularly in hot weather. He claims it is “Gatorade for people who don’t like sweets.” I love him. I grew up eating my Grandma’s homemade dill pickles like the supply was endless and moved on to canning my own pickles as soon as I had a kitchen of my own. My little sister, Jessamine, and I compare our homemade pickles from year to year the way some people compare wine vintages. But there is one pickle that stands head-and-shoulders (were pickles to *have* heads and shoulders) above all others. I’m talking about the pickles you see here. That’s right: Homemade Claussen Knock-Off Pickles. These are homemade refrigerated deli pickles, also known as Lithuanian half-sours, also known (in the commercial equivalent) as Claussen dill kosher pickles, also known as the best pickles ever known to mankind. Here’s the thing. While I do love my other homemade pickles dearly (otherwise why would I continue canning ninety-something quarts year after year after year), these are by far my all-time favourites. CRUNCH. That’s what you hear when you bite these. There is no flop, no squish, no slime. These things almost bite back. Claussens were long the benchmark for which I aimed in pickle making. I was so happy to nail it with this recipe for Homemade Claussen Knock-Off Pickles! No matter what, a canned pickle is not going to end up like that lovely Claussen: crunchy to the point of making noise when you bite it, cold, and seriously garlicky.Canned, shelf-stable pickles can be chilled, maintain some crunch and be as garlicky as you want them to be, but they are never, ever going to be the same thing because of science. When you heat process a jar of pickles you are, in actuality, cooking it and a cooked pickle just plain can’t be as crunchy as an un-cooked one. To put it another way, these pickles are not suitable for canning. They’re simply not acidic enough to can safely, and that is in addition to the fact that you’d ruin that perfectly crisp texture by introducing heat to the party. Here’s where we get into bonus happy territory. You don’t have to cook anything to make these pickles; not one single thing.The brine is stirred together, the cucumbers are rinsed, trimmed and stuffed into a jar with garlic cloves and spices. Please, please, please give these a go even if you have never made a pickle before.There is nothing scary or intimidating here. Wash, slice, stuff, stir, pour, sit, wait. Okay wait. Yes. That last bit is hard. The waiting is hard. On the plus side, the wait is only two to four days which is significantly less than the six week wait of the canned pickles. Besides, as I said, there is the crunch factor. Get on the homemade Claussen knock-off pickle train, my friends, there’s plenty of room for all of us and if you don’t know what to do with the leftover brine, just pass it to my husband. He’ll “dispose” of it for you. Crrrrrrrrrrunch! What can I serve with these Homemade Claussen Knock-Off Pickles? 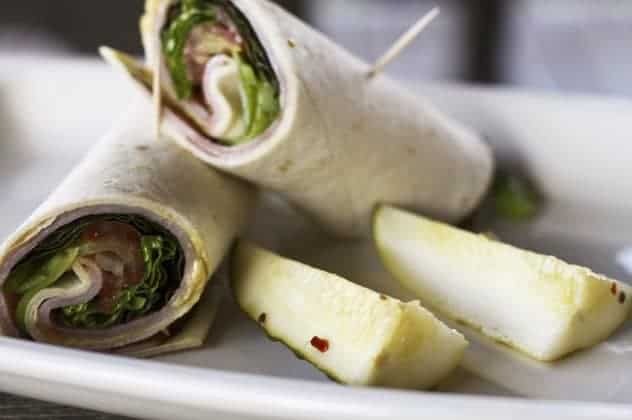 Try them in this Dill Pickle Dip, Dill Pickle Egg Salad, Bagel Burgers with Dill Pickle Cream Cheese, Dill Pickle Pasta Salad, Dill Pickle Butter, or with these Buffalo Chicken Sandwiches, Trashy Barbecue Pulled Pork and Toasted Cheese Sandwiches, and Cheeseburger Salad. Always crunchy and garlicky, this perfect homemade pickle requires no special equipment, no canning experience, and tastes just like Claussen's refrigerated kosher dill pickles. 2/3 c. coarse canning or kosher salt Do NOT fine or use iodized salt! 4 fresh dill heads ~or~ 4 tablespoons dried dill seed not weed! Wash cucumbers but do not scrub them. Trim 1/8-inch from the blossom end of each cucumber and slice in half lengthwise or into quarters, depending on how large your cucumbers are and how big you want them to be when they're done. In a gallon jar (or large, wide-mouth, food-safe container) layer the dill heads or seed, garlic cloves and sliced cucumbers. In a separate pitcher or bowl, stir together the remaining ingredients until the salt is dissolved. Pour the brine over the cucumbers, taking care to make sure all of them are fully submerged. If needed, place a plate or mug or other non-reactive heavy item on the cucumbers to weigh them down and keep them under the brine! Cover lightly with a lid just perched on top or secure a piece of cheesecloth over the jar with a rubber band to keep fruit flies away. Leave out of direct sunlight on the counter for two to four days*, or until the cucumbers taste like pickles throughout. Fix your lid onto your jar or container and chill. These can be stored in the refrigerator for up to six months provided you keep them covered with brine. *If at any point in the proceedings "fuzz" or "foam" develops on top of the brine, use a spoon to remove it. If there is "fuzz" attached to any of the cucumbers, remove the ones affected and be sure the others are still fully submerged. This post was originally published July 22, 2011. It was updated and reposted July 2017 and August 2018. Love it! Now if only I had more than a handful of pickling cucumbers ripe at the same time! OMG….we are a pickle lovin’ family too and Clausen’s are our faves and guess what I have growing in my garden? Pickling cukes! I’m so making these! I know a jar will last like 10 mins in this house. I know I have told you this before but I have to say it again…I love your sisters name. Jessamine. I think if I had a girl I’d name her that, that’s how much I love it. My oldest is Jesse, so maybe I’m just stuck on a Jess thing. Carrie- Oh, you will soon enough… I make these hand-over-fist while my cucumber plants are at their peak production. My husband also drinks pickle juice! And I love these pickles. My family loves Claussen’s pickles – they were my very first one. My mom used to spear pickles on a fork and we’d lollygag outside during the summer with our delicious, cold, crisp, salty pickles. It was heaven. I can’t wait share this recipe with my family and try making them! never made pickles before – how should I cover tightly without screwing a lid on? Wayne Baker, is your wife’s name Ruby? Just found your site and absolutely cannot wait to do some of the canning you have listed. I don’t have a large enough container to put these into all at once, which I think is what you are saying. Would I be able to do this in individual jars? and how much dill and garlic would I put into each jar? And would they have to be in a fridge or could they go on the pantry shelf if the room is cool? Can’t wait to try some of your recipies. I’m sorry it took so long to respond, Debora. You can certainly put them into smaller containers, just divide the ingredients between them. As to how much to put into each container, it sort of depends on the size you use. I’d say use four quarts instead and then you can divide everything into four! Hey I made the pickles, they taste good, but my brine in the jar is cloudy, does that mean they are not any good? Made a gallon jug of them. Had very little form on top when they were ready in 4 days. Hard water minerals can make your brine cloudy. If it bothers you, try using distilled water. Awesome. Works great. I make them all the time. I call them short pickles. I make them and the brine. Leave them on th counter foruse bottled water. You have so much vinegar, salt garlic and dill that nothing bad will live in the brine for months. Made these.. No fuzz .. I’ve had them sitting on counter covered with brine for a week..should they be in refrigerator? It sounds like a good time to stick them in the refrigerator! Claussen are my favorite, the only pickle I’ll eat! Thank you! I love you! And my husband will too. I think we have 4-6 jars of Claussens in our fridge right now. Thank you SO much for posting this recipe. I made them Friday and just had my first pickle of the batch today. Simply put, they are amazing! Thank you!!! this is exactly what i was looking for!! i can’t wait to make these, i have cucumbers coming out of my ears, lol. I have been looking for a recipe to mimick Claussen! Yay, I can’t wait to make these! Thanks! Congrats on your TK feature too! I am confused about the very last part too! Cover the jar lightly. Do not screw a lid into place! Do you mean to screw the lid into place??? Please help as these sound AMAZING I really do want to make them. I just made these this morning. They are sitting on my counter now. I used my large stockpot and put a plate on top of the cucumbers to make sure they were all submerged. This is the first time I have ever made pickles, I hope they turn out good. I also put the pot lid on upside down since I didn’t have cheesecloth. I made these, and on the morning of the fourth day I woke up to foggy brine. They smell nice and fermented, taste fine (says my husband), but is that OK? I put them in the fridge right away, but are they safe? If they still taste fine, and there’s no “fur” on the pickles then they’re dandy! No worries. That happens as part of the fermentation process naturally sometimes. I have what looks like mold on mine? ? Depending on the type of mold, you can skim the top, remove anything in contact with the mold, and be okay. Thanks so much! I feel much better about serving these to friends now. Now if you have a salsa recipe safe for canning that does not include canned (store bought) tomatoes, my summer would be complete! Thanks for the recipe, this is exactly what I’ve been looking for. Can’t wait to try it. Just one question: I have a pouch of Mrs. Wages quick process dill pickle mix. Will this work for the spices for your recipe? what do you use for your picking spices?? I have a mix that I like, but it is for pickled peppers, so I’m wondering what I might be leaving out that would be good with pickles. Hey there, Joe! I tend to leave out the cloves and cinnamon bark on mine. For some reason, the flavour of those just kind of hops out at me. So in short, I either sift through and pick those out of a purchased pickling spice, or combine my own! I LOVE this recipe….I’ve used it for years! In fact, if you *have* to can your pickles, you can use this recipe and process in a boiling water bath for 15 minutes. They come out really good, even cooked! Can these be made with whole pickles also? I prefer the smaller ones and not have to slice them, but most all the recipes I find tell you to slice, halve or quarter the pickles. can I make these in plastic, like tupperware? I am trying to learn whether or not a jar of Claussen pickels- UNOPENED- which had set over night on the counter (unrefridgerated) might still be safe to eat??? Claussen says they are best kept cold and will not state clearly one way or another. If yo made you knock offs- how long could they set- after being sealed- before you would throw them out? I can’t say with confidence how good your pickles are, as it depends on many conditions. As for the knock-offs, they’ll hold until they grow fur or are slimy! The smell of the brine is already out of this world. Can’t wait to try them! On a side note, I stuffed the jar so tightly that I don’t have to worry about any not being covered by the brine. There is plenty of room between the sliced cukes, but they won’t float, which is great and I don’t have to worry about any touching the air. Jessamine. Do not screw a lid into place! They come out really good, even cooked! these looks great. I love clausen pickles. I always affraid they are too hard to make them myself. Maybe I will give these a try. Does the brand of pickling spice matter? I’m not a snob about much of anything…but I’ve always only liked Claussen Kosher Dills. (I’m a pickle juice drinker, too, and as a kid, my favorite sandwich was peanut butter and pickles! ha! ) But I don’t even like other dill pickles. All that to say, if your pickles taste just like Claussen’s, I want to be sure to get it right. My husband is thick in garden-planning mode right now, and I know if I don’t have my recipe ready, we’ll be up nights this summer canning pickles I won’t eat :(. Tragedy, indeed. 😉 So, could you divulge your brand of pickling spice, please??? Well, Shelly… I honestly don’t know the brand I use. I buy the bulk packages up at my local Amish grocery. One thing, though, is that I pick all the cloves and cinnamon bark out of the pickling spice. I don’t like those flavours in my pickles. I’d say that as long as your pickling spice is pretty standard (McCormick’s, Spice Islands, Frontier, etc…) you’ll be fine! I love this recipe, it’s the only one I’ve found that dosent have sugar in it and I love claussen’s pickles… but, how would you recomomend going about re-sizing the batch for a smaller amount, such as 1-2 pint jars of pickles? These look awesome. Just one question though. Should regular apple cider vinegar be used or the raw kind like, Bragg’s? This is the exact type of recipe I’ve been looking for! But can I process it for a longer shelf life? I know Claussen’s need to stay refrigerated, but I don’t think I have enough room in my fridge for so many pickles. Also, my friend’s always want pickles as gifts! So, processing- yay or nay? Allison- I am so sorry to tell you this, but you might need to buy a pickle fridge. 🙂 Unfortunately, these do not process well. They’re meant to be a fresh/fermented pickle. I concur with everyone above..these pickles look awesome. Can these be made without the salt? is it part of the pickling process or just for taste? I’m on a 1/4 of sodium per day ration. that should be 1/4 tsp per day ration. You can’t use it for canning because of the anti-caking agents but MORTON’S LITE SALT, half salt – half potassium salt substitute will allow you to a half teaspoon instead of a quarter teaspoon for seasoning your meals. I’ve used it since it was released and prefer it’s flavor. I accidentally let my pickles sit out/ferment on the counter for 6 days. For some reason I thought they were supposed to sit out for that length of time. I tasted one this morning and it seemed to be fine. Other than the brine looking murky I never saw any fuzz. I went ahead and put them straight into the fridge with the lid on. Do you think they are OK after sitting out for a week? Hi Alyson… I think you’re fine! You just took it a step further and made full sours instead of half sours (think deli lingo.) Of course, use your own judgment based on smell, taste, appearance, etc… but if they are as you say they are, they should be safe. 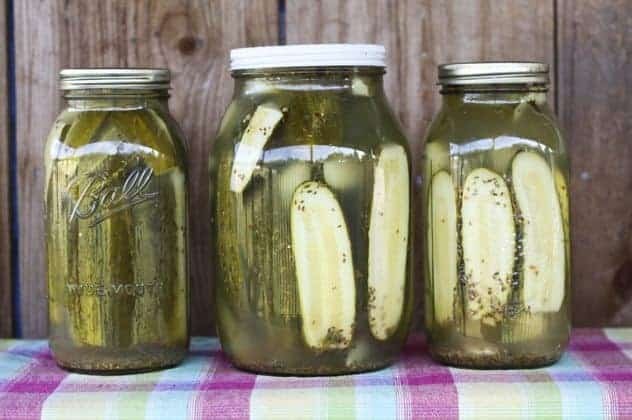 Is there any way to process these pickles for long term storage. I would like to make a large batch, but do not have the room in my refrigerator to keep them all. Any information would be deeply appreciated. I would say you’re absolutely fine if you refrigerate it! Every year I try my hand a making pickles and every year I get that cloudy area at the bottom of the jar and I toss them out because I don’t know how to tell if they are still good or if I am growing some bacteria that will land my family in the hospital. What is that cloudy area? Is it safe? Can I make pickles without it? Heather, my research shows that the cloudy area in fermented pickles (such as these) indicate the presence of lactic acid (a by-product of fermentation.) That is backed up by several cooperative extension groups’ literature (like this: http://www.clemson.edu/extension/hgic/food/food_safety/preservation/hgic3101.html ) However, and this is a big one, you need to be the one who makes that decision. Mine are almost always cloudy, but I’m serving a family that has hearty immune systems and is not prone to getting ill. If my family had any immune-compromisation going on, I would be infinitely more cautious. It has to be your call! Mainly because that’s how I learned to make them and I like them that way! Just brought home a nice load of picklers from the local farmer’s market yesterday, got my jars washed, and about to start mixing up the brine to try some of these. They look and sound wonderful! You say use 1 gallon of water, do you mix the gallon of water with the 2/3 cup of salt and vinager and then use what brine it takes to fill up the gallon jar that has the pickles already in it. Yes you do! You got it! Rebecca, In the interest of canning these pickles for long time storage without loseing the crunch,, do you suppose that “pickle crisp” could be used without fouling the recipe? ?I was thinking about adding it After fermentation was complete, just before the hot water bath to seal the lid??? Your thoughts??? Hi Scott. To me, the appeal of this particular pickle is the fact that it isn’t processed. I really haven’t tried heat-sealing them. When I do heat sealed pickles, it’s the other recipe I have up here on the site. I’d love to know how it goes if you try them, though! I must be missing something. If I fill a gallon jar with cucumbers, how is a gallon of water, plus a cup of vinegar, plus 2/3 cup of salt going to fit in the jar? Thanks for getting back to me so quickly. Taken in that context your recipe is very similar to the one I have used for years: Two quarts of water, 6 Tbs salt, 3 Tbs vinegar. This makes the exact amount of brine needed for a gallon of cukes. I let them ferment for about two weeks before refrigerating. We’re definately on the same page. Can you slice them into slices you’d use for like a burger or do they have to be spears? So excited to try this!!! Marlo, I can’t speak for others, but when I make my pickles I slice them the long way only once, giving me two halves. After the pickles are cured & ready to eat you can cut the thin slices as needed. So, I made these and the taste is divine but they are incredibly mushy. The cucumbers came fresh to me from a farm, so they weren’t the problem. Any ideas? There are a couple possibilities, Jamie… The most likely is that you didn’t trim a bit off the blossom end of the cucumbers. The less likely issue (but still a possibility) is that it was just that batch of cucumbers. Hmmm. I cut both ends, actually. Any chance it was the amount of time in the brine? Left it in for four days, until they were not greeny cukey colored but pickley colored, then refrigerated in brine in Ball jars. I cut into spears. I used considerably less cukes than suggested. Wonder if any of that affected the result? Wow, I have been searching all over for a crisp, claussen type pickle and you have provided the right recipe! I made some last week and they are so good I can hardly believe it. I made my own pickling spice from a recipe I found and added this to my brine. I also added fresh dill and lots of garlic. I am impressed that they are not too salty, as some dills are. I just got done with another batch, hoping this turns out as good as the first. They really are very crunchy! I am saving the brine to make a batch of bloody marys with it…if it lasts that long! CRUNCH! I’ve used your recipe for the first time. I,m hoping for a good turnout. I put the pickles in a gallon jar for the four days you suggested. I want to transfer them to smaller jars but am not quite sure what to do with all those spices. Can I rinse off the spices and cover with a fresh brine without the spices for clear liquid in the jars. You will not water bath or pressure can these. You package them into jars, crocks or plastic pickle jars and do not heat them. The Cucumbers will be soggy if you do. Pack them put juice in, close lid and put them in the fridge, About a month later…ENJOY!!! Kind of dumb question here, but when I layer the dill, garlic and cucumbers, does it matter what is on the bottom and top? That’s not a dumb question… I do the dill and garlic and spices on the bottom so the cukes hold them in place! You’ll love ’em, Pamela. I say exercise patience just a bit longer and wait until they’re chilled clean through to eat them. You won’t regret it! Okay, can I use cucumbers? I bought a whole mess of regular cucumbers thinking that it wouldn’t matter. Hi! I Made these and the look great! I used a flat canning lid to keep the pickles down in the brine. On the second day they looked fine, on the third there was a little white fuzz above the lid, but not underneath on the pickles. Are these ok to eat if I get rid of the fuzz and refridgerate them right away? Bad throw them out, also this is way to much salt and I use Durris Farms cold pack, 3 level tblspns of pickling salt. More heart healthy. Salt pomotes the celluae breakdown of tomato to allow flavor to enter. Use less salt and you can taste pickles or green tomatoes at 6 weeks. Actually, these yield delicious pickles year after year after year. There is no tomato in the recipe either. I’m not sure where that’s coming into the picture. The reciepe for the claussen pickle was followed but the juice turned cloudy after three. They also taste a little like perfume. Don’t know how else to describe the taste. Put one slice under each arm and go to the dance. You will have many interested men. I made these, yum! I used distilled water instead of tap water & sterilized everything first. In my opinion, very close to claussen. I think if one were to play with the spices instead of mixed pickling spice, one could get even closer to claussen. That said, mine are a 8 out of 10. Very good & easy to make. I’m making more tonight. I saw your recipe for the pickles on the Pioneer Woman’s website. I made them last Monday – let them sit on the counter until Friday. I did four jars and let me say they are fantastic. I’ve only tasted one jar so far and we just love them. After I made them my husband (who loves pickles informed me he doesn’t like homemade pickles) well he does now! Now I’m going to try your Pickle Dip – I’ve never heard of it either….I’m really enjoying your blog! Another dumb question. What is in “mixed pickling spices” or is such a mixture available at stores. Just a note on an old wives tale. Kosher salt is the same thing as table salt. One is fine grind one is course grind. Iodized salt is usually kosher (approved by rabbis for observant Jews to consume) too; the iodine is made from kelp and in such trace amounts you can’t tell the difference. All salt except canning salt have additional minerals… occurring naturally, or added to help the salt from clumping. Pure canning salt usually isn’t designated kosher ( look for a K,P or U symbol or the words Kosher for passover) but I can’t imagine why it wouldn’t be approved. Ps, Kosher Pickles (Like Kosher salt) is a style of pickle and not necessarily “Kosher” or approved by the rabbi’s for consumption. Yup, another fun fact! Kosher salt is labeled as such for its long use of making meats kosher, not because it was made in accordance to kosher guidelines. just to hone what you said and further clarify with a slight adjustment, different grind sizes of salt (ex..table vs Kosher) will ALWAYS measure out differently , making it easy to oversalt when substituting a larger kosher style crystal for a smaller table one. More table salt fits in a teaspoon than kosher salt. As for iodized….i HEARTILY disagree. You can and most definitely WILL taste the difference ; maybe not the iodine flavor itself, but it’s effect on the salt. It somehow makes salt SALTIER (and not in a good way!) and wreaks flavor-havoc in some dishes. Back in the old days iodine was affed to prevent goiters. I wish the manufacturers would stop killing perfectly good salt with it. My Brother makes these puts them directly into the fridge, and they turn out just fine. I have the juice and jars from 3 jars of the claussen pickle slices…they were on clearance…any chance I could use that juice to make a follow up batch? Should I add some things? The juice tastes fine..heck I’m considering pickle juice martini’s as I type. I’ve never tried that but I’d love to know what happens if you do! We do that, and it works! We’ve added our own cucumbers to the Claussen pickle juice. We actually boil the pickle juice first and let it cool. Pack the cucumbers in the jar and pur the room temp pickel juice back over and refrigerate. The only issues I have with that are that it cooks what was raw garlic, and it doesn’t get rid of the gnarly ingredients I am keen to avoid like HFCS. l strain the garlic & spices out & reserve them. l then boil the Clausen brine and let it cool. l add cucumbers & green tomatoes & the bribe to a sterile jar & refrigerate. lf you love dill pickles, you may also like pickled green tomatoes. Any suggestions as to where I could buy pickling cucumbers in the off season? They are easy to find during the summer, but not in March!!! These are good pickles but they taste literally nothing like Claussen. The only thing these and Claussens have in common is that they’re both, in fact, pickles but that’s where it ends, you’d have to not have taste buds in your mouth to think they’re a good copy. Not that anyone cares but here’s what I think to get them closer to Claussen: eliminate the pickling spice, claussen’s don’t have it, add mustard seed, some red pepper flake and use WAY more vinegar, white vinegar not apple cider, and put them directly in the fridge, because these ones turned out soggy from sitting on the counter for 3 days. I can’t tell you in what quantities, you’ll have to experiment, but that’s what I’m going to try. Well, I guess this boils down to an agree to disagree moment. I use my own homemade pickling spice which omits cloves and cinnamon thereby more closely resembling Claussen… And if your pickles were soggy, you may have left the blossom end intact OR gotten old cucumbers. The beauty of food preservation at home is that every batch is just a wee bit different. I thought the taste was spot on. I got pickling spice from a farmers’ market and just pulled out the cloves. I made a 1-qt batch. They turned out perfectly after 3 days and we ate quite a few the first day. Within 3 days of being in the fridge, they were complete mush, like absolutely disintegrated. 🙁 Not sure what happened. I cut the blossom end off as written and they were super fresh cukes. Super bummed, but willing to try again! I hate to say it, but some cucumbers just behave badly. It’s just like canning pickles, sometimes it just doesn’t end up the way we want it to. One in about every fifteen batches goes funky for me. What is in your pickling spice mix? Is there a way to actually seal these in jars? A thought is to try the Trader Joe’s version. I like them a lot and think they are cheaper than Claussen and you are not supporting corporate America (Gen Foods). At over 400 stores nationally, isn’t Trader Joe’s ‘corporate America’? Well it’s your website…. If you think it tastes the same then who am I to argue? I have them in jars in the frige, just a little confused why 4 batches tuned out perfect and one does not, is the amount of salt a key in the process? Can you do this process with fresh okra? I honestly have no idea! Let me know if you try it! Can you put whole cucumbers in or do they have to be sliced. Sorry if this is a dumb question but I have dill plants in my garden and I don’t know what you mean by a “4 heads” of dill. The flowering yellow heads at the top of my dill plants wouldn’t even fit in a gallon jar. I’m using the green new stuff below. How many sprigs per jar? It’s not a dumb question at all, but those enormous flowering bits are exactly what you want to put in there… Those are the seed heads and that is what packs the dill pickle punch! If your seed heads are truly gigantic, you can reduce the number you put in by one or two. Feel free to man handle them to cram them in the jar! I don’t know what went wrong…I followed the instructions to the letter and my pickles are too salty and lot of them have “mushy” spots showing up on them like they’re going bad while in the jars in the fridge…can you help? These taste wonderful, but I do have 2 questions. I did get some fuzz, and I cut off the ends that had fuzz and left the rest of the pickle in the jar. I had them out for 3 days, put them in the fridge, and the next day got them out to eat and the are fizzy? There are bubbles at the top and they give a little fizz sound, are they OK to eat? Thank you very much. I think next time I will put directly in the fridge or in a cooler darker spot. Not sure what happened. Day 1-2, all systems go. Day 3, brine started going cloudy and I had a fizz effect when I opened the jars (like they were carbonated). Still tasted like cukes and had read that cloudy and fizz was ok, so didnt worry and left them on the counter for one more day. Looked at them today, Day 4, more fizz and the tops of all of the pickles were mushy at the tops. What did I do wrong?? I think it sounds like it should’ve gone into the refrigerator on Day 3… You could lob off the mushy bits and put them into the fridge in time to save most of them, though, I think! How would I break down this recipe if I only wanted to make a jar or 2? Not surw I have any gallon sized containers, and/or dont have access to that many pickling cucumbers. If you’d prefer just to make a quart or two, you can certainly divide the spice amounts and amounts for the brine recipe by half or reduce by 3/4. It’ll definitely work! So you say there’s “no spectre of the BOTCH”. How are you preventing it? I’m just curious as I’m starting to get into canning and want to know more! Do you think you could use this to pickle other things? I’m interested in doing this to all sorts of vegetables. How does the recipe yield 2 gallons of pickles when all the cucumbers are placed in a gallon container? I mixed up the brine and only half of it fit into my gallon container. The BRINE portion of the recipe yields enough for 2 gallons. You’d need twice the cucumbers specified in the recipe to use up all the brine. Hi, I was just wondering if this recipe could be used and the pickles could be made via water bath canning to make them last longer? I have A LOT of cucumbers… Thanks! Also… if you can do the water bath canning method, would you have to tweak the recipe or use hot water vs cold? Any differences in the recipe? THANK YOU!! This is my second year using your recipe as a base. I go almost verbatim but I add a little more dill and a lot more garlic – usually a whole head. And my signature touch is 3 ghost peppers – enough to put 1/2 in each finished jar. I use my garden fresh ones in season and dried ones from the fall before when pickling in the early summer (super hots don’t start harvesting until late August in the midwest). I use 4 when they are dried just make sure they have that punch. I sell my extras at work and never make enough to keep up with demand! Thanks for an A+ recipe. I want to make these, love Clausen pickles. Can the amount of salt be reduced as I am on low Salt diet, if so this will be awesome. Thanks. For a true FERMENTED half sour follow recipe as written but only add ACV AFTER 2 to 4 days on counter. That’s what I do and have great results with this recipe. Google recipes for half sour pickles and you will find vinegar interferes with fermentation. And thanks Rebecca for your pickling spice recipe. I use your combination of spices and LOVE it! Thank you so much for this amazing recipe! I live in Japan and it’s so difficult for me to get the dill pickles I know and love. Claussen Pickles are my absolute favorite and I always felt like I had to eat as many as possible whenever I visited home. But I tried this recipe last week and I was so happy – a great imitation of Claussen! Would you mind if I linked this recipe (with credit to you of course) in a blog post on my website? Remember when you’re making fermented pickles that the cucumbers must be completely submerged beneath the brine. Otherwise you may get furry bits. I seem to be running my family crazy with my love of pickles, they keep telling me I’m going to turn into one, I just can’t get enough! I have one question concerning your recipe as I’m new to pickling. Several recipes I’ve seen say to use bottled water but I noticed yours didn’t, I’m confused. I can explain the usual instruction to use bottled water. Many times this instruction is included under the assumption that people are on town/city water and therefore have chlorinated water. Using bottled water (theoretically, anyway) eliminates a variable there. This is true, of course, only if you use bottled water that you’re certain is free of chlorine, which can be a touch tricky. If you use distilled water that is a surefire bet that you won’t have chlorine, but it’s also certain that it will be free of any tasty minerals. As I am on a well, I know fully that my water is safe and chlorine free, so I tend to leave that instruction out. I would say if you’d prefer pickles that you can guarantee are chlorine/fluoride free and you’re on town or city water, you might go for the bottled water. If you’re on a safe well, I’d skip it. I love this recipe! But I was wondering if these have to be left out or can they be put in the frig to ferment? I tried a batch and they were fine and smelled divine days 1 & 2, on day 3 they were fuzzy on top so I scraped the fuzz off per your instructions. Day 4 they were even fuzzier and had a foul odor like they were rotten. I threw out the whole batch. I used a glass pickle weight to keep them in the brine and made sure they were on a non sunny spot of my kitchen counter. I do live in Florida, though, so even in March with the A/C on it can get rather warm. I want to try again but this time putting them in the frig, still only covered with cheesecloth. What do you think? I’m thinking it might take longer, though? I have heard that if you use water for the pickles instead of vinegar, it will be better for probiotics. So can you leave the vinegar out or if you do it won’t make it a Claussen? It’s also worth noting that Claussen pickles are not fermented, they’re pickled. I know it sounds weird, but the best way to describe the difference between the two is that fermented vegetables are made with a salty brine and the sour flavor comes from natural production of acid during the fermentation process which will also be high in probiotics. In the pickling method, an acidic brine is used (typically by the addition of vinegar) and the brine imparts the sour flavor on whatever is soaking in it. This method will be lower in probiotics because vinegar inhibits the fermentation process and therefore the good bacteria does multiply like it does during fermentation. Do you have to leave these out on the counter or can they just go into the refrigerator right away. I understand they may take a little longer to marinate this way. Any thoughts? Hi Eric- If you flip through the comments you may find a few folks who have done that. I have not personally tried it, so I can’t speak to it from experience. I prefer just to use the room temperature approach. I tried this recipe, my family loves them. So easy to make. Hello. I made batch of these on Sunday. Waiting rather impatiently for the four day window to end. I only had a few pickling cukes, and not a large enough container to make a full batch of brine. So I cut the brine recipe in half, and yielded two quart jars of pickles. I have a couple of questions. I did pour leftover brine into a clean, empty quart jar, then refridgerated. It is very tasty by the way. I have been sipping on it daily. My first question is this…the leftover brine tastes more salty than the brine with the cukes. Not too salty for my tastes because I love salt. But I was wondering if that is normal for the taste difference to be present. My second question…I have been watching my jars daily during the fermentation process, and I have not seen any fuss or mold on the cukes nor on top of the brine. Did I do something wrong, or is this just a bit of good luck? Thank you for sharing this recipe. From what I have tasted so far, I think they will be fantastic once chilled thoroughly! Thanks for the size and temp clarification! We’re heading into day 3 of the process and (knock wood) so far, so good. New question though: Once these are placed in jars and put in the fridge for long-term storage, how does one keep them 100% under the brine? I am predicting that these things are going to want to float. Correct? If so, what’s the solution for keeping them submerged? They do have a tendency to float, Carly. I usually pop a saucer in the jar upside down and that little bit of weight does the job. Does this recipe work well for whole pickles, rather than halved or quartered? I LOVE whole pickles! You betcha! As long as they’re not, well, femur sized… You want to use more petite whole cukes if you’re going for the whole pickle effect. Can you cut cucumbers in chucks?? I have not tried that! Let me know if you do! I have my first batch of these pickles down right now; I have used regular cucumbers instead of the pickling ones and noticed this morning when I checked them after 24 hrs. that the cucumbers feel limp at this point. I am assuming that that will change as they bathe in the mixture. I also used fresh dill, lots of it, from my herb patch and lots of garlic! I make pickles a lot but have never tried these and Claussen are my favorites! Thanks for posting and I can’t wait to see how these turn out. Hi Carol- I hope they crisp up for you. Regular cucumbers definitely don’t hold up as well texturally to the pickling process as the little picklers, but the flavour should still be good! Hi Laura- These are not suitable for canning. These are fresh pickles, so you’ll want to store them in the refrigerator rather than canning them! Hello! I tried out your recipe and the pickle brine has become cloudy. I have them in the fridge now but wanted to know if that is normal. The liquid is not clear like other pickles. Is this ok? That’s fine and dandy! As long as the top doesn’t grow fur or start sassing you like a teenager, cloudy is good in these quick-ferment pickles. It means it has fermented! I found these to be incredibly good. The cloudy brine kinda puts me off, but there was no slime or mold, and the pickles taste good. Going to make another batch already. They’re kind of addicting! I’m going to try adding a bit of horseradish to a jar this time. I’m used to canning pickles in a boiling water bath, but this is much easier. Thanks! This is cool. Thanks for posting this. Do you know if it is okay to use less salt for a low sodium version? Thanks. Quick tip for anyone making them in regular mough mason jars- 2 or 3 toothpicks inserted long ways underneath the neck of the jar holds them under the brine just wonderfully! I have had mine on the counter for 3 days and just can’t help myself anymore..
That is a fantastic pointer, Crystal! Thank you! It wasn’t until much later in life that I developed a craving for pickles and pickle juice. I love it no mater the season and now I just pour myself a small glass anytime of day. I use Bragg’s apple cider vinegar when the jar gets low in juice and the mother in the vinegar cultures it a bit and gives it a little fizz. Delicious! Sorry, I only eat Vlasic pickles. They are the most crisp and delicious in my opinion. Sometimes, I make my own Japanese pickles in a Japanese pickle press. They are, of course, delicious with any type of Japanese meal, sushi, tempura and even Japanese curry. I may try this recipe, however, at some time. Thanks for posting it. I love the idea of stretching the pickle juice with Bragg’s! I see the Claussen pickles use distilled vinegar. Should I use apple cider vinegar? I love to use apple cider vinegar when I am fermenting pickles because I prefer the flavour of it. Claussen also adds sweetener to their brine which I do not do. If I wanted to process these in a water bath for sealing, how long would it process for? I would like to seal the jars instead if keeping in the fridge. I don’t have room for that. Does anybody know how claussens seals their Jars? They must surely use a hot water bath. Unfortunately, this recipe is not suitable for canning as the acidity is far too low. Claussens is always in the refrigerated section, as well, and advises refrigerating their pickles, so I wouldn’t store theirs on a shelf either. Can’t you also use the left over Claussen pickle juice and soak new cucumbers in them? Hi Murray- That’s a decent solution but won’t give you QUITE the same pickle as doing it from scratch. It’s not advisable to leave the Claussen brine out at room temperature. I cant wait to try this it sounds delicious and easy. And in case you aren’t aware, pickle juice is an almost instant remedy for leg cramps and charlie horses. I read that several years ago in a magazine (like Good Housekeeping) that they had done studies with college athletics and severe cramps-85% of the athletes experienced almost instant relief. I kind of poopooed it but thought I would give it a try. A few nights later I woke up with the full deal-charlie horses in my thighs, calves and feet. I stumbled to the fridge like a toddler learning to walk, swung open the fridge door (with the light blinding me) and grabbed the jar of pickle juice and guzzled it like a thirsty wino. Within 30 seconds the cramps were subsiding and I could actually make my foot go flat on the floor! Sorry if I shared too much lol. That is actually awesome knowledge because I get horrible foot cramps all the time! I would love to try this recipe. My processed pickles are way too squishy! One question- what kind of cider vinegar? Apple cider vinegar? Yes to the apple cider vinegar! I think you’ll love these! Can these pickles be canned (preserved)? Unfortunately, these are not suitable for canning, Laurie. They lack the proper acidity and will not hold up well to the canning process. how do I break tese measurements up for just one jar of these pickles to test and see if my kiddos will eat them?? I am doing an outreach for a movie in the park, my family is sitting up a booth and we’re going to do pickle sickles (frozen pickle juice) shots of pickle juice, and the pickles in the jar we’re going to stick a wooden cabob stick in them and hand them out. My question is how can I keep the pickles good without the juice. I’m hoping you can help me with this, thanks for whatever you can tell me. Hi Angie- That sounds like fun! I am thinking that you may want to prepare double the brine for the pickles when you make them since you start the clock ticking on deterioration once you pull the pickles from the brine. I’d say you wouldn’t really want to have them out of the brine more than 4-5 hours before serving, and then you’d want them tightly wrapped in a refrigerator or cooler. If you make extra brine, though, you could keep the pickles submerged even after taking brine out for the picklesickles. By the way, I love the idea of pickle sickles! 1) Is it alright to use coarse sea salt? 2) Is cider vinegar apple cider vinegar or something different.? That is AWESOME, Elise! Thank you so much for taking the time to let me know you loved it as much as I do. I use little pickling cucumbers for this, but larger pickling cucumbers would also work if you cut them down to size. Picklers are a little different than the ones you get at the grocery store; they’re easiest to find at farmers markets and farm stands. The ones at the grocery store are usually coated in wax and a different variety that doesn’t pickle quite as well. In a pinch, I’d say you could probably sub in English cukes that are cut down to size, but I’d do a smaller batch to be sure. Hi from North Georgia! I have trellises of cuke vines that look like kudzu. Here’s my chance to do something wonderful with them. … Can you add to the crock over a period of days, like some other fermented pickle recipes I’ve seen? … By the way, pickle juice is great for alleviating muscle cramps, is a good remedy for mild heartburn, and, your husband is right; it’s a great way to replenish electrolytes and fluids in hot weather. I’m a salt lover, too. What do you put in your own blend or what commercial blend would you suggest? I would like to srore my for a year. Can i process them. I’m afraid these are not suitable for canning/processing both because of acidity level leaving them unsafe to store at room temperature and because the processing would make them suffer texturally. Why leave the jars on the counter for 2-4 days? Why not put them in the fridge right away? The pickles need to sit at room temp for a couple of days to kick-start the fermentation process. Cold temperatures slow or stop fermentation. Could the recipe be halved? Could quart jars be used instead on gallon? Hi Judy- Yes you can! It’s absolutely fine to halve or even quarter this recipe. Use whatever jars you have on hand! I made the pickles! I actually followed the recipe, and those things are the pickles I have been wishing I could make. I brined mine a little longer, but, I’m a glutton. My wife says that she’s drink some of the juice…in a dirty martini or a Bloody Mary. LOL! I passed your recipe along. Thanks for a good thing. Rebecca, you are very kind to answer so many of the comments. I read all your readers’ comments & questions before deciding to post one of my own. I’m going to try your recipe on my garden-fresh cukes, which aren’t really pickling size – they’re big slicers, from just one plant. Our problem is the one plant is out-producing our ability to eat the cucumbers, and honestly, I’m just not a fan of raw cukes. The baby cuke plant was given to me by a gardening buddy, and I’m determined to do something with the cucumbers. I don’t expect miracles, and I will try your recipe again when my pickling size cucumber plants begin to produce. I have already shared your recipe page with my family & friends. Thank you so much for posting. Do you have to refrigerate all the pickles or can you leave them in the brine until you are ready to start a new jar? Can I put these in jars and if so how would I go about the canning? Using the recipe? Hi Trena- Unfortunately this recipe is not suitable for canning. 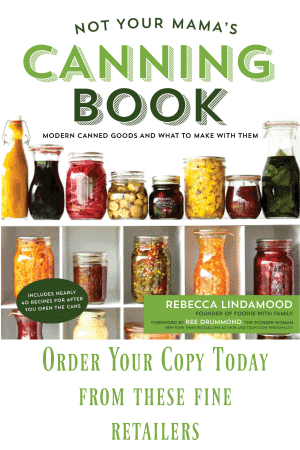 The acidity is not the right level for shelf-stability after canning. Additionally, the pickles would suffer texturally during processing. I don’t think it will be bad at all, just different! I am a bit confused by the size of the jar. If I use a gallon jar and use a gallon of water, won’t there be displacement caused by the cukes? Maybe I am missing something. Thanks! There will absolutely be displacement, but you may need to top off the brine now and again, so it’s good to have extra! God Bless you, lady! I made one large batch of those things, and about have to stand shotgun on the fridge when people come by! Many many thanks for a recipe I’ve been looking for, for a long time. Theses pickles are THE BEST! However, I put them directly in the refrigerator; they taste wonderful. The first batch I followed the procedure, but discovered they were just as good without worrying about the “foam”. Thanks for the recipe! I am from Ontario Canada and fell in love with Claussen pickles living in Minneapolis with my now ex who played for the Minnesota North Stars hockey team. Do you have a video of your recipe? Hi JoAnne! I do not have a video YET, but one is in the works! Thank you for your informative recipe! You make it sound so simple, and your pictures are great as well! Can’t wait to try this at home, it seems like something that I could do in an hour and have pickles for the next few weeks! My family would love it. Thank you again for sharing! Thanks so much for sharing your recipe! Quick question: I just finished pouring brine over the cukes, but had stirred the pickling spices in with the salt/water/vinegar. I have quite a lot of spices still floating in the leftover brine. I followed your directions as to stuffing the jar with cukes, garlic, and dill; then followed your direction to stir remaining ingredients together and pour over the cucumbers. Was I supposed to layer the pickling spices in BEFORE adding the brine? If so, should I drain the leftover brine and add the spices into my jar? Hi Jessica! I would skim the spices off the top of the brine and plunk them into the jars with the pickles. Reserve the extra brine to top off your jar if the levels drop! Hi there! I can’t wait to try out your recipe! I only have one issue. I don’t have a gallon jar on hand and I have a bunch of pint sized jars. I’m super new to canning and I’m not sure how I would go about dividing up the ingredients into a bunch of pint jars. If you could help me out I would be ever so grateful! Thanks in advance! I cut the recipe in half but still needed 4 quart jars. Will they still turn out ok? Try adding a small piece of stick cinnamon and a few grains of fennel to your brine. Claussen does. I have made these refrigerator pickles for years. I put one head of dill in the bottom of each wide-mouth Ball jar, add the cucumbers and brine. Then, I put another dill head on top, and add a jar lid and ring. I keep the jars on the kitchen counter for 3 days but cover them with a clean dish towel as light affects the brining. The dill head on top pushes the cucumbers beneath the brine. Each day, I turn each jar upside down a couple times to redistribute the brine and seasoning. Then, I put the upright jars back on the counter and cover again. In 3 days, refrigerate. Mine keep for up to a year in the refrigerator without degrading. After making 4 1/2 gallons of these, I was absolutely sick when I opened a jar to taste. They were horrible!! The pickles were soft and I cannot describe the taste. DO NOT waste your time and money like I did. They may be easy, but they are not edible. It sounds like something went wrong with your batch, LeaAnn. That could have been caused by old cucumbers or using the wrong cucumbers, using cucumbers that had the blossom end left intact (which releases an enzyme that can soften the pickles), using iodized salt, or bad bacteria being introduced to the jar. Iodized salt can really ruin a batch of pickles! The other thing that can cause an issue like that is if you processed the jars instead of following instructions and letting them sit out at room temperature before transferring to the refrigerator. Any heat processing will destroy these pickles. It really is impossible to tell what went wrong having not been in the kitchen with you, but there have been so many happy people who have checked in after making these to share their results, so I would encourage you to try again but on a smaller scale! Can i ptepare these in a stainless soup pot and then transfer to jars for storage? If so, when in yhe orocess should I make the transfer? Hi Jeanne- I haven’t tried that, but I think it should work in theory. If I was to try it, I would transfer them to jars when I was about to stick them in the refrigerator. 😀 If you try it, please let me know how it works out for you! I followed the recipe to a T and mine turned out super salty, almost inedible. Should it be 1/3 cup of salt or 2/3 like the recipe says? Hi Matt- I’m betting you used a different type of salt. My recipe is geared toward Morton’s Coarse Kosher Salt. If you used any other brand, it may have been a finer grind which would mean you ended up with more salt in your brine. The recipe is accurate as written, and many people have been quite pleased with the results, so I think that may be the issue. 2/3 cup Salt = 90 grams. 1 gallon cold water = 8.344 lb. or 133.5 ounces, or 3,784.838 grams. Your recipe makes a 2.4% salt solution, before adding the vinegar. Since the weight of 2/3 cup of salt and the strength of the brine will vary with the size and density of the salt crystals used, the only way to get consistency of results is to weigh the ingredients. Vinegar: I have never seen vinegar specified in any other recipe for Kosher style pickles! Won’t the vinegar inhibit the lacto fermentation process? Hi EZChef. I actually use Morton’s Coarse Kosher Salt which is a slightly different grind than Diamond. And as for the vinegar, it is a very small amount compared to the brine AND it is raw cider vinegar, so there is the mother to contribute to the party. Morton’s salt has a finer grind, so 2/3 cup weighs more than the same volume of Diamond Crystal, and yields a stronger brine. Do you know, what 2/3 cup of Morton’s weighs? With that number, I can calculate the percentage, for you. I’ll try the vinegar (with the Mother) next time. table salt weighs 10 oz. Diamond Crystal Kosher salt weighs 5 oz. Morton Kosher salt weighs: 8 oz. Do not use McCormick pickling spice. This makes the pickles taste like corned beef. Keep it simple – garlic, salt, peppercorns, dill seed and mustard seed (optional). I’ve got about half a gallon of brine leftover – can I refrigerate it and use it when I have more cucumbers? Any other suggestions for using it? It smells so good. You can definitely refrigerate it and plunk more cucumbers into it!!! We have our pickles sitting in the gallon jar but want to transfer, at some point, to the quart containers. Did I read something wrong? I don’t really want to eat them out of the gallon jar, plus they take up a lot of room in the fridge that way. What do I do? P.S. This is the first year we have attempted canning anything! You can absolutely switch them to quart containers. Feel free to do so right before transferring into the refrigerator! Best pickles ever! I made a gallon to try, they turned out great! My wife loves them ! I have 2 gallons brewing now. Hooray! I’m so glad you like them! I love pickles. Thanks for your recipe. Do you have good bread & butter pickles too. Thank you. Have you tried making fermented pickles? The procedure is similar except the brine only consists of 1 tbsp kosher or sea salt to 1 cup of filtered or distilled water. You leave the container of pickles on the counter to ferment for 9 days. No vinegar is necessary because the fermentation process creates lactic acid.after 9 days of fermentation you store pickles and refrigerator. These are by for the best and crunchiest pickles I have ever made and they taste much like Clausen. They’re also beneficial because they contain helpful bacteria which is good too replenish your intestinal Flora similar to the effect of eating yogurt. I am confused. Does this recipe make 1 gallon of pickles? If so, where does all the water go? I assume it is to be included as part of the brine. If I am wrong please let me know. These are the best pickles! I’ve made several varieties over the years and these ones are by far the simplest AND the tastiest. Thank you for sharing this recipe!! Can you put these in smaller jars..or do the pickles need the entire brine? You can definitely put them in smaller jars, just distribute the pickling spice, dill, and garlic cloves evenly before pouring in the vinegar, salt, water mixture. Perfect! And easy! I used an abundance of garden fresh zucchini, garlic, and hot peppers, as well as cucumbers in this recipe and it all tasted wonderful. Bubbles are fine: no worries! The bubbles are carbon dioxide – evidence of healthy fermentation. Very close to the cold water pickle recipe from my Mother in law, her’s also had one small dried red pepper I’ve used red pepper flakes. Her best tip for crisp crunchy dill pickles is to NEVER use Chlorinated water, if I’ve had great success with distilled water (make sure it’s distilled as bottled water can contain Chlorine). Why not dill weed instead of dill seed? There are a couple of reasons. First and most importantly, the dill seed provides a deeper, stronger dill flavour than the frondy weed/leaves. The seeds have a more traditional “pickle” flavour. That’s why when using fresh dill, you put in the seed heads. Second, the leaves/weed tend to cling to everything and float unpleasantly in the pickle brine while the seeds settle helpfully to the bottom for the most part. I was so excited to make these pickles and am quite proud of my jars! I tried one yesterday, after three days of sitting, and it was awfully salty. 🙁 Will this change while they sit and refrigerate? 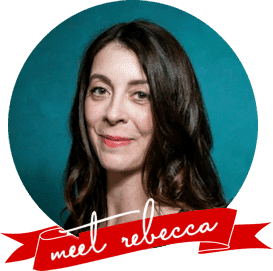 Hi Rebecca, I’ve been making Claussen knock-off pickles for years, but I lost my original recipe, and last year’s batch did not turn out very well. So I’ve been looking at a lot of copycat recipes. I notice that many have a ration of about .25 cup salt, 1 cup vinegar, 3 cups water. Yours is much more diluted, with .66 cups salt, 1 cup vinegar, 1 gallon water. Any thoughts or info on the variation of brine strength? BTW, I use green tomatoes instead of cukes. Claussen used to sell them, but not any more. I just made a batch, with a 5% solution, and it came out very good. Lacto fermentation generates its own acidity, but I’ll add some cider vinegar, for flavor, after I refrigerate the jars. Thanks EZChef for this information! Now I can more accurately compare recipes. The batch I made last week was apparently about 7.5% salinity, which I subsequently learned, is close to commercial strength brine. Give Us Feedback: Let us know, what brine strengths and curing times you have tried, and how your pickles turned out. That way, we can find the optimal recipe. 7.5%, and 6 days on the kitchen counter (turned daily) produced a very good result. I just made a jar of pickle spears, with a 6% brine, and they tasted Good, after only two days of curing. Day 1,and I tasted my pickles and it was a little salty. What can I do to save them or will the taste change the longer they stay in the brine. The taste changes for sure. Did you use Morton’s coarse kosher salt or another salt? Yes I used Morton coarse kosher salt. You MUST weigh the salt & water, to arrive at the right percentage solution. The same volumes, of table salt or Morton Kosher salt or Diamond Crystal Kosher salt, will all weigh different amounts. What is the correct portion to make the brine for 2 quarts and 4 pint jars. Add alum for extra crunch. I’ve never used alum in fermented pickles. I wonder how it would work out. Where would I buy mixed pickling spices? I made this recipe just as directed and they turned out PERFECT! I’m dreaming of garden cucumbers so that I don’t have to buy them next time. SO great. Wheeeee! I’m so glad you loved them! I made these last summer with the abundance of cucumbers from our garden. They were easy and the end result was enjoyed by all. I will either make my own pickling spice to leave out the cloves. While the cloves are not unpleasant, they just ad a flavor that I do not associate with refrigerator dill pickles. Clove goes with sweet pickles to me. Anyway, as the jars aged in the refrigerator (I had a 2 recipes), the brine became a bit “boozy”, not cloudy or fuzzy, just a bit bubbly. I’ll use this recipe again. I do have a question for you, have you ever used this recipe and then processed in a low temperature hot water bath to have a shelf stable pickle? While I have a second refrigerator, I’d like to have a shelf stable version as well. For a third batch of pickles, I tried another recipe that I found and had high hopes for the results. BUT, the end result was a pickle so salty that we couldn’t eat them. (https://www.youtube.com/watch?v=7MKGTCj4GXc) The low temperature canning recommendations come from National Center for Home Food Preservation, http://nchfp.uga.edu/how/can_06/low_temp_pasteur.html. I’m so glad you love these pickles. I love them, too. I’m afraid this recipe is not suitable for canning because of low acidity. It’s the acidity that really cinches it, unfortunately, and that’s one of the hallmarks of the flavours of this pickle. thanks for your reply. I will make your recipe again and will continue to pursue a shelf stable kosher dill. I just made these tonight. Hopefully they turn out well. I used 2 of the extra large canning jars which are actually to large to use if you’re processing anything. 4 other jars of pint and a half. The pint and a half are also freezer safe. I’m wondering after they sit out for, 4 days if they would keep longer if you freeze them? Hi Anna- I wouldn’t freeze them as I’m thinking that will be very likely to make your pickles mushy. Enjoy your pickle bounty! Yes, thanks I was wondering about that mushy business too. My Amish cousins make freezer pickles for when they host church but they are sweet and sliced very thin. They are good but I love these garlic Dill better. Could you use this for pickled eggs? I am trying to find a clearer brine. Hey there, Grover. I think after you’ve pickled cukes in it, it would be lovely for eggs. I’m not sure if it would be sufficient to pickle it before it’s gone through the fermentation process with the cucumbers in it, though. I make bottle y on dill pickles every year. I bring the brine to a boil and pour the boiling liquid over the cukes, then seal and put in a cool place till around Thanksgiving. I have to differ with you on your statement that they wont be crunchy hnoisy crunchy when bitten) though. Mine are always firm and crunchy every time, no matter if it’s 2 months or a year after I make them! But, that being said…even though nothing tops homemade I do love Claussen and will be giving this recipe a go! Thanks for sharing for all of us pickle lovers! I prefer them over any popsicle or ice cream! I have a great Mustard Pickle recipe if you want. I love them so much I snack on them like candy! I’ll choose them even instead of chocolate! Excuse the typos! Oh, and I didn’t go beyond a year on the crispness because I completely run out by the next pickling season. Between me and my husband and both of our families I’m lucky if 3-4 doz. qts. last the full year! LOL! But I love to share all of my canning projects with family and friends! I followed this recipe exactly last season. All pickles were properly submerged and all went bad. Such a waste of work, growing,harvesting, picking, waste of refrigerator space, etc. I have no idea why. Hi CBard, without being in your kitchen, it’s hard to know what went wrong for you. Many people have had great success with this recipe, so I have to assume it was an issue with the cucumbers. Perhaps they just weren’t the best pickling cucumbers? Or if they were gathered at intervals and some of them were older when they went into the brine, they may have already had the enzyme that causes softening released in them. It really is hard to know! Hi Michael- It sounds like those may have gotten a little bad mold in them unfortunately. The cloudiness is nothing to worry about- all brine does that at some point. It’s the fuzzy mold that concerns me. When you try this again, taste the pickles each day. When they taste flavourful throughout, you can move the jar to the fridge whether or not you’re at 3 days. We have quart jars on hand are confused as to how you use a gallon of brine when the pickles are going to cause displacement. Can you tell us how? You may not use the entire gallon of brine, but it’s best to have it on hand since you’ll need to top the brine off once or twice because of evaporation. I very rarely leave comments but these pickles from this recipe turned out so good that it just is it’s amazing it blew my mind this is my go to recipe from here on out ! That is fantastic, Nadine! Thanks for letting me know! This is a great recipe! Love it! I use half gallon, wide mouth jars. I found some good size cheesecloth bags that fit over the entire jar. I put those over the top like a sock and then screw just the band on before leaving them on the counter. Works wonderfully. Just wondering why there is no alum in this recipe. Doesn’t th a help the CRISPINESS? This particular recipe doesn’t need it, Jeanne! Do these have to stay refrigerated? Or can I just put a rubber seal on top and keep on shelf? Will one cup of brine cover the pickles? Hi Angela- One cup of brine will definitely not be sufficient to cover the pickles. Thankfully, the brine portion of the recipe makes quite a lot more than one cup. I used the stove top for this recipe, they turned out amazing!!! How can all these ingredients fit in a gallon jar when yo have a gallon of water and vinegar and 34 cucumbers? Hi Judy- The short answer is that you won’t fit it all in at the beginning. The extra brine should be stored in the refrigerator to top off your pickles as needed. I made these. So simple. Why do they cost more? Because they have a short life. So will make them whenever I can. Going to add sugar to make them sweet next time. Love the easy recipe!! Going to try this, but I have a question. Could I use the leftover juice from a Claussen jar (many) to use in this same manner? I was just wondering if the juice can be reused after all the pickles are gone? Hi Kim- I sometimes toss a couple of fresh picklers into the jar in the refrigerator, but I don’t re-use the brine to re-start the process. We like spicier pickles, so added double the garlic and two Serrano peppers with seeds in the bottom of the gallon container! Everything else the same and they are great! I love the idea of spicier pickles. Thanks for sharing your idea, Eddisu! You nailed this Amanda. Every year I use your recipe. Thank you for sharing! Hi Thomas- I have mentioned it a couple of times in response either to you or to other readers, but four pounds of cucumbers when cut into spears or halves should just fit with the dill and spices and garlic when squeezed into the jar. There is no way all of the liquid will fit, but you keep the excess to continue topping off the jar as the liquid evaporates. Best of luck! I should also mention that it will take a little packing to get the pickles in there, but that’s as it should be. You don’t really want them floating around in the brine as much as you want them to be well submerged and snug. Made these for the first time…cut recipe in half and made 6 jars of pickles! This recipe NAILS IT! I’ll NEVER buy Claussen again when i can make em for pennies and its hard to tell the difference! THANK YOU for this recipe!!! Ya CRUSHED the pickle game!!! Thanks so much, Gene! I’m so glad you love them, too! Has anyone tried to freeze these? Should you crush the garlic cloves or put them in whole? I’m afraid not, Robert. These are not suitable for canning. I LOVE this recipe!! Thanks for sharing. I won’t be making any other pickles than these. Thank you, Christy! I’m so glad you love them! Hang onto it! You’ll probably want to top them off from time to time! Hi! I tried your recipe as I was excited to make knock off clausens. However my brine got very murky and the pickles had a bitter Zac taste to them at the second day. So I put them in the fridge and now the cukes/pickles are mush and they just squeeze/ooze out of the peels when I pull them out of the jar. Any thoughts as to what I did wrong? I followed your recipe to the t and I used fresh picked cucumbers from my garden. Why preferably RAW cider vinegar in your recipe? How does that make a difference in you recipe? You are right— best pickles in the word! What do you mean by pickling spices? Do I have to go buy a package of some other brands pickling seasoning? Are there any special instructions for cleaning the jars before making these pickles, like sterilization? Or is that only if you were canning the pickles? Easy to make, simple recipe that results in wonderful claussen tasting pickles!! Kudos!! This recipe calls for twice the brine needed. Eg, I reuse Claussen plastic jars labelled 64 ounces, ie, half gallon jars. I make half the liquid+spices recipe in one jar, then layer 9 large cukes (trimmed& quartered), garlic, and dill seeds intotwo other jars. Finally, I pour the brine mixture into the two jars, and it exactly fills them to the top. The pickles will be crispier if you start with refrigerated water, vinegar and cukes. I hope it works out for you, too!! This recipe is amazing! They taste better than any store bought high end pickles I’ve bought!! The only recipe I will ever use and it is super easy. Hooray, Lisa Marie! Thank you so much for such a great rating and I’m so glad you love it! I tried your recipe and although the delicious flavor was still in the brine, every pickle was absolutely mushy and completely unedible. Any ideas on where I went wrong? This recipe sounds amazing! Have you ever tried throwing any other veggies in the brine to pickle as well? I love pickled carrots, cauliflower, onions, pepper, and mushrooms! Just wondering if you think the same process would work on these? Hey Lindsey! Thanks so much! I hesitate to say yes or no on whether the process would work on other veggies, but I would definitely plunk them into the brine after eating the cucumber pickles… I’d just stash that in the refrigerator. If you play around with it and love the results, please let me know! Hot dang, that all sounds so good, Lindsey! I may have to give it a go myself. It sounds a little like a fermented giardiniera! and thanks for making my day!!! I am so going to try that. I didn’t know it was a remedy. Thanks for sharing Lindsey. I had the same problem – cut mine into spears and used your recommended spices, etc. but they were MUSH – I threw them out. I also saw that someone put theirs in the freezer for an hour. Even if that helps, should I maybe only cut into halves when sitting on the counter? Thanks. can I use course Himalayan salt???? and apple cider vinegar?? Can/should the garlic be minced? I went ahead and made them and answered my own question. No mincing/chopping of the garlic was needed. I left the cloves whole. I did however use distilled white vinegar (I am not a fan of ACV) as well as distilled water instead of tap just to be on the safe side (I live in Georgia). For me, it was dill seed because I didn’t have heads of fresh dill. I cut the recipe in half because I didn’t have enough cukes for a full gallon. But forget all of that these taste GREAT! This was my first time making pickles and I can truly say Rebecca nailed it on this one. I am now going to make these instead of buying the expensive ones from the grocery store. So simple to do and so crunchy and garlicky. WOW! By the way I used Marshalls Creek pickling spice. It was perfect for me because I hate cloves and cinnamon (yuck). These pickles were spot on for my taste buds after the 4 days. Really don’t have to worry about how long they’ll keep because I cannot stop eating them and they will be gone soon! Thanks for sharing this. Hi from New Zealand, where Dill Pickles are not really a tradition, or if they were with the early settlers the tradition never reached our family, even though we have Polish ancestry from the 1800’s. The pickles are mostly called Gherkins and the supermarket varieties are mostly VERY inedibly sweet. I have a very sweet tooth, but since working hard at it for the past several years, I just can’t takecane sugar anymore, it burns my mouth! So. I just made these two weeks ago. THEY ARE AMAZING! Last year I made just plain lacto fermented cukes, which some of the grandchildren devoured by the jarful. But lots of jars went soggy quickly and graced the compost with their presence. These pickles are incredible. For those in the Northern Hemisphere, plan your gardens NOW, order your seeds, and grow LOTS of pickling cucumbers AND perhaps budget for a PICKLE FRIDGE. We just decided to! Currently harvesting 13 cucumbers every couple of days, and the pickling varieties haven’t really started yet, so it’s pickle mania around here! How long can you keep refrigerated home made pickles? From my understanding they will keep for like 5 or 6 months in the fridge but mine won’t last tht long because we ate them! My brine turned cloudy, all pickles are submerged, its day 4, now in the refrigerator. 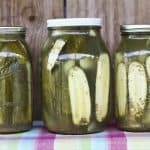 Do I have throw pickles away because of cloudy brine? Cloudy brine is fine!!! No worries! If it starts getting fuzzy, you would want to throw it out. You pick out the cinnamon and cloves but leave the allspice in the pickling spices? So glad I found this recipe .I’ve been trying different pickle recipes for years and this one is by far the BEST !! I did add fresh dill to my jars but other than that i didnt change a thing . Thanks so much, Bee! I’m so glad you loved it. 🙂 I love adding fresh dill when it’s available. I have never seen just raw cider vinegar….do you mean apple cider vinegar? Or where would I find just cider vinegar? Hi Aomori- Raw apple cider vinegar (raw cider vinegar) is vinegar with the mother still in it. A common brand is Bragg’s. If you live near Wegman’s Grocery Stores, they have a store brand of raw apple cider vinegar. Basically, it still has the “starter” in it and adds a probiotic to your finished product. If the jar is a gallon and filled with cucumbers, a gallon of water won’t fit. How much water should I use for the brine? Thanks! Hi Eric! You’re correct. It won’t all fit in there at once, but much of it will. I still recommend making the full gallon because you don’t know how much will fit (much depends on how tightly packed your cucumbers are) and you’ll probably want to top off the liquid over the next couple of days as it evaporates. I have loved Claussen’s since forever, and will definitely try this recipe (thanks for posting it!) noting CrackerjackHeart’s advice of using distilled water to alleviate cloudy brine. 1. When you say, “Wash cucumbers but do not scrub them”, can you be more specific? Does this entail only rinsing them (in cold / hot water) and/or rub them with your bare fingers? 2. I’d bet the brand / version of each ingredient (especially the raw cider vinegar & pickling spices) will affect the taste of your Claussen Knock-Offs, so, what brands / versions of the ingredients did you use? Regarding the raw cider vinegar, do you suggest an unflavored version (not apple-flavored)? Please explain sparing no detail – TIA! HI there, John! Great questions. 1) I mean to wash with your fingers in cool water but not scrub with a brush. 2) I use Bragg’s raw apple cider vinegar straight from the bottle. I would not use a flavoured version, but generally speaking apple cider vinegar and cider vinegar are the same thing. Raw vs. pasteurized would be a bigger flavour difference. And as for spices, I generally use McCormick’s or the no-name brand blend I get from an Amish bulk market nearby. Either way, I’d say that you’d be fine! What is your favorite variety pickle? Do these have to be stored refrigerated?